New Holland was birthed out of the entrepreneurial spirit – the spirit of innovation and leadership that generates new ideas, new products and new business processes. This month, we’ll look back at the decade spanning 1926 to 1935. In 1927, New Holland enjoyed record sales with feed mills and also introduced a new line of rock crushers, pulverizers and other quarrying equipment. Production and sales of the rock crusher, in particular, exceed all expectations and New Holland begins a decade of constructing roads to prepare for a growing automotive industry. In 1932, Fiat introduced the 700C or Tipo 30, the first crawler tractor to be mass-produced in Europe. It was widely used in African colonies where it proved irreplaceable in cultivating the region’s loose sandy terrain. 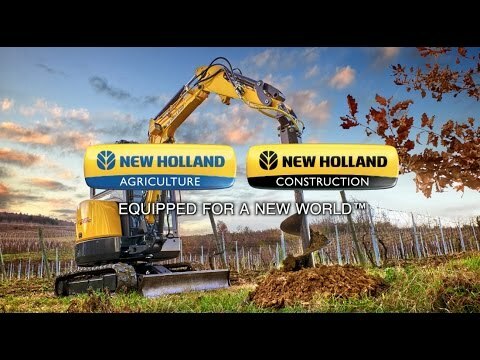 With its best-in-market skid steers, New Holland Construction continues to be a global player in agriculture, landscaping and building. Skid Steers offer a tight turn radius ideal for tight settings and New Holland’s patented Super Boom® vertical lift provides the furthest and highest reach in the industry. Its stable, long wheelbase and broad array of easy-to-change attachments helps operators load, stack, scrape, and carry safely. When it comes to road maintenance, snow removal, and construction New Holland tractor loader backhoes are a popular choice among municipalities that require affordability, versatility and safety when making heavy equipment purchases. Plus, municipalities like that New Holland tractor loader backhoes can be driven on the road - saving time, manpower and money associated with loading and hauling heavy machines across town. What makes a New Holland tractor loader so special? Its loader arm has higher digger and breakout force, which enables higher productivity. New Holland’s straight load arm design uses the full weight of the entire machine to push into pile, providing more force to dig with less stress on the loader arm. Just as Fiat’s historical crawler tractor was instrumental in navigating sandy terrains, New Holland’s modern day compact track loaders are equipped with tracks instead of tires, making them ideal for maneuvering on muddy terrains. Less ground pressure ensures smooth movement without destroying grassy medians, fields and yards. So what can you expect in the future? In the coming years, skid steers will likely be equipped with the same technology found in larger construction equipment. Machine control will automate the grading of roads to within a 1/8” of the gradient setting, requiring only one pass for grading and eliminating manual clean up work. This will provide a tremendous savings on labor costs. Fortunately, dealers like Martin Implement are already helping New Holland provide products for the Next Generation Customer. See how they’ve helped Hanson Brothers become New Holland SMART. Franklin Equipment in Columbus, Ohio also helps customers make SMART choices. They offer dedicated equipment rentals, which enable business owners and municipalities the option to use machines before they buy them. Their “rent with the option to buy” helps makes equipment affordable for buyers while giving them the satisfaction of knowing they’ll be happy with their purchase long before they make it.